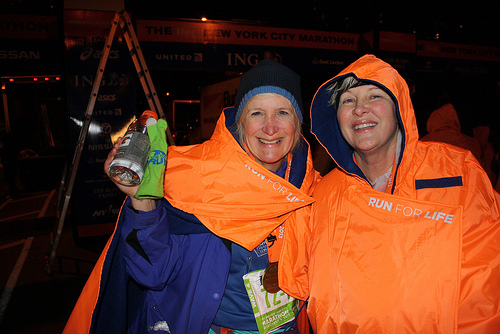 Dale Pierce-Taylor 62, of Atlanta, Ga., and Clare Ronaghn, 51, of Dallas, Texas, pose happily for a photo after finishing the NYC Marathon late Sunday night. By Zoe Lake. 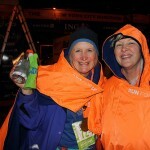 “I understand there are a few more runners left on the course let’s try and get things wrapped up by 9:45,” said a ING New York City Marathon volunteer coordinator standing under the orange glow of the Central Park street lamps lighting the last mile of the marathon course. Volunteers wrapped in bright orange marathon blankets stood huddled and attentive, ready to cheer the final remaining marathoners across the finish line before heading home. Meanwhile nearby another group of volunteers applauded as Clare Ronaghn, 51, of Dallas, Texas raised her arms in triumph as she strode across the finish line. 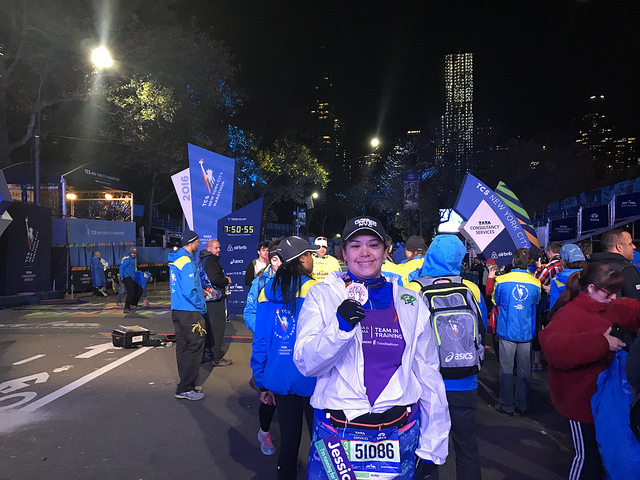 This has been Ronaghn’s fifth NYC marathon, and she said it will be her last. Joined this year by four of her family members, two who ran for the first time, Ronaghn was the last of the bunch to finish, however this did not discourage her. Ronaghn was waiting for 62 year-old Dale Pierce-Taylor from Atlanta, Ga., a friend she met and encouraged along the marathon route. Applause erupted from one of the volunteer groups standing in the 37 degree cold at the finish line, and Ronaghn rose to her feet to cheer Pierce-Taylor across the finish line. The women embraced and a volunteer handed Pierce-Taylor her medal. A self-described stand-up comedian, mother, and ovarian cancer survivor, this was Pierce-Taylor’s 20th marathon. The women huddled together for a laugh, reminiscing about high and low points on the route. “Brooklyn was awesome, they were rocking it,” said Dale-Pierce. “They really came through for us.” Ronaghn nodded in agreement. “By the time we come around, at a lot of points the crowds and the cheering has died down,” said Ronaghn. 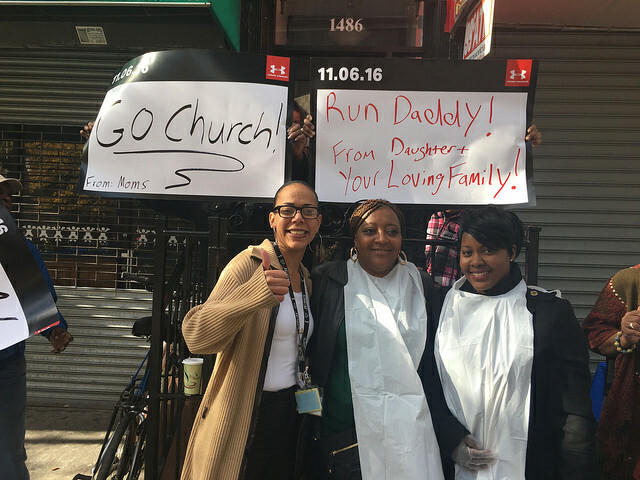 Dale-Pierce recalled one specific moment in Queens where Ronaghn’s encouragement really made a difference for her. “She was like a little energizer bunny,” laughed Dale-Pierce. 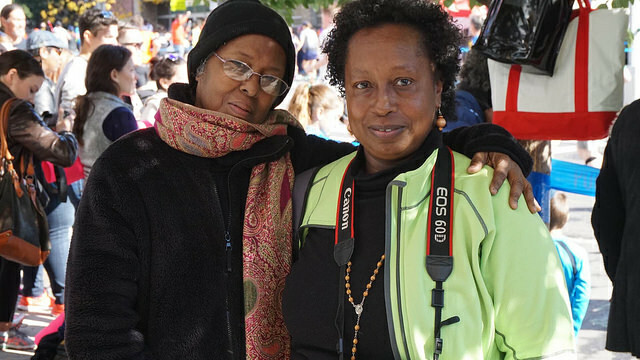 Stories like these inspire volunteers like Yolla Assaf, 42, of Midtown West, and Caroline Morales-Jogeeah, 50, of Kingsbridge, Bronx to dedicate their time to the final remaining runners. 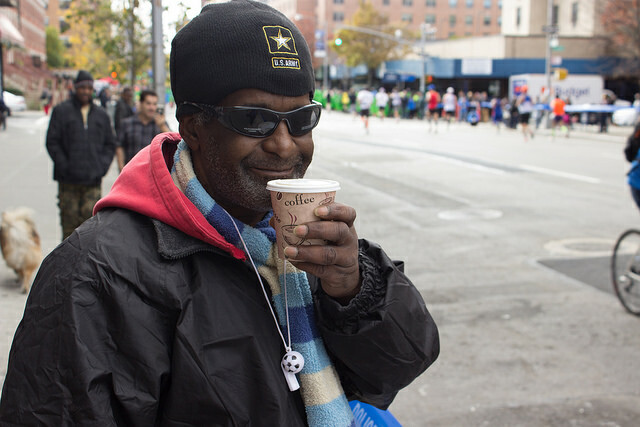 “We like to cheer them up so they feel encouraged, I want everyone to have the same feeling. They made it like everyone else,” she said. Assaf, who works as an interpreter at the UN, volunteers as a translator for foreign runners who need assistance. “Even if I’m not American, it makes me feel good. I do it every year,” she said. As volunteers moved to clear the area for the final clean up crews Ronaghn and Pierce-Taylor, decided to share another journey, this time a cab ride home.